SuperWater is neither a spring water nor a mineral water and its benefits extend far beyond those of water magnetised by metallic electrodes to enrich it with specific minerals. • adequate provision of fuel for energy (ATP). • provide a surplus of active oxygen ions, not in the free radical-generating O2 form, but in the negative electric charge form, OH-. In addition, it has the unique property of penetrating the cell intima where mitochondria are located – the powerhouses that produce ATP. In a two-week study of individuals of all ages (mean age 53 years), all participants showed a clear increase in ATP. Levels rose from between 0 and 1 at the start of the study to between 4.5 and 8 on the reference scale. These effects on vitality and well-being can be attributed to increases in intracellular ATP and to the alkalisation of the site. 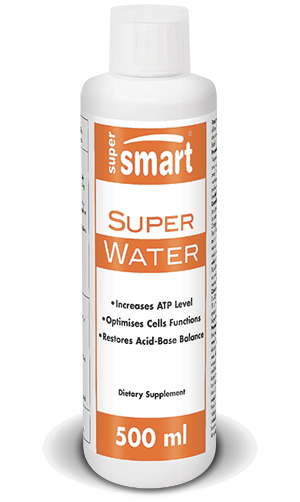 SuperWater is thus an excellent detoxifier, able to neutralise the chronic acidosis caused by modern diets which are almost always too high in animal protein and cereals. • improving sports performance and recovery. SuperWater can be taken at a dose of 20ml diluted in 250ml of (still) water, twice a day. The first glass should be drunk in the morning on an empty stomach. adults. Take 2 x 20 ml a day diluted in 250ml of (still) water.